And now, for Jana’s question(s). 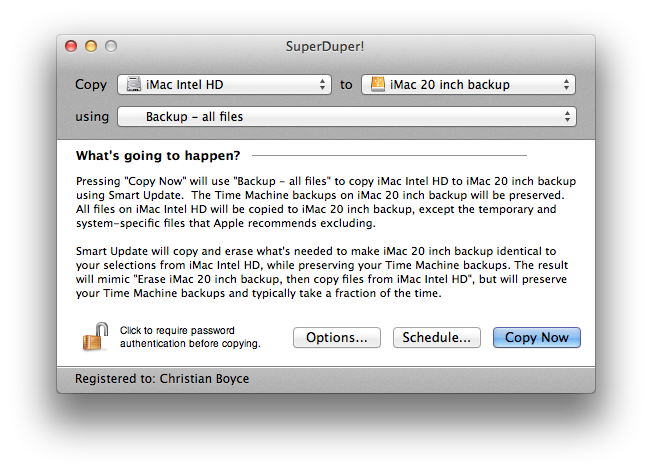 Q: I have a Time Machine backup already, but I’d like to periodically make an exact copy of my Mac’s hard disk on an external disk (so I can store that disk offsite). Is there a way to automate this? 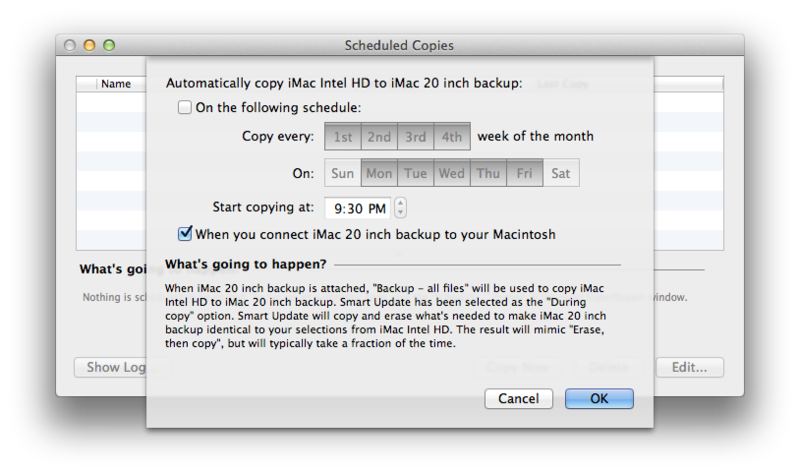 Now all you have to do is remember to periodically connect your external hard drive to your Mac. 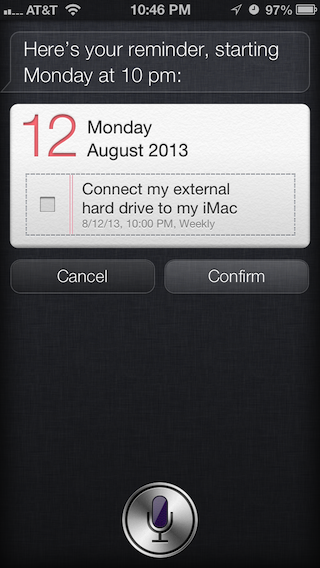 Q: Is there a way to make my iPhone remind me to periodically connect my external hard drive to my Mac? Notice in the fine print that it says “Weekly”– just what you wanted! Now, every Monday at 10 PM, a reminder will pop up on my iPhone’s screen, reminding me to connect the external hard disk. If you don’t have an iPhone, but you do have Mountain Lion (Mac OS 10.8) on your Mac you can start the Reminders app there and enter the reminder info by hand. Q: Can you help me pick out an external hard drive, and can you tell me where to get a good deal on one? A: Yes. 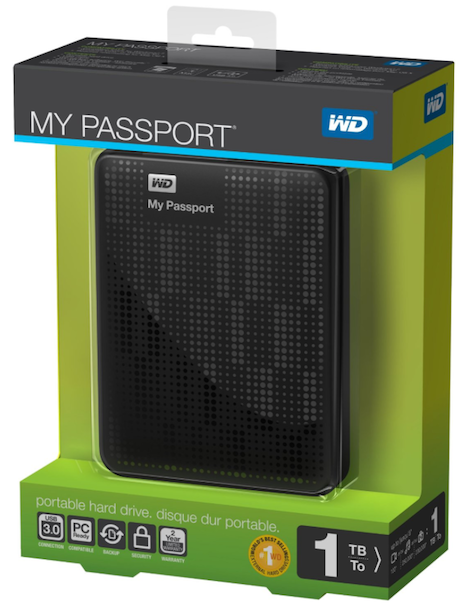 The Western Digital “My Passport” is a very good drive– small, reliable, and inexpensive. It connects via USB and does not need to be plugged into the wall. This is very convenient, especially if you’re going to be connecting and disconnecting fairly often. 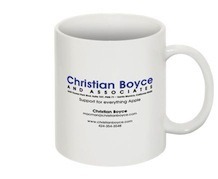 It comes in various sizes and Amazon* carries them all. If you need to get one today try BestBuy. Here’s what the My Passport drive looks like. It’s barely bigger than a deck of cards. Amazon has this one* in blue, red, silver, and black. Click “Storage” at the top and read the size of the disk. 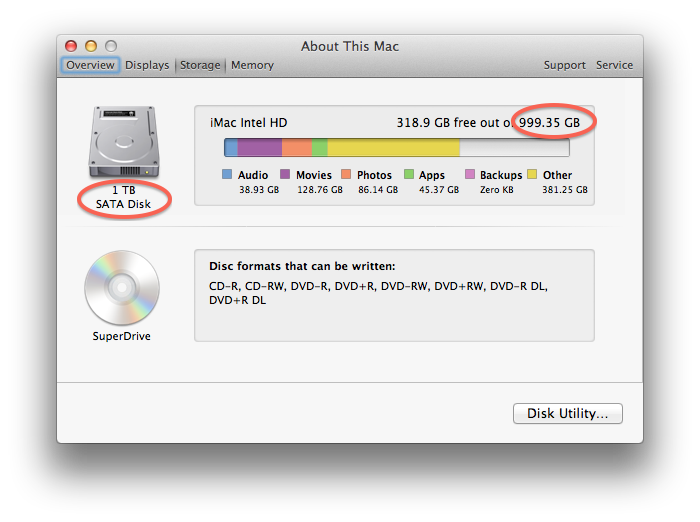 Here’s how mine looks, and yes I know 999.35 GB is not exactly equal to 1 TB but it’s close enough. Q: I notice that the answer to all of these questions is “Yes.” Do you ever get a question where the answer is “no”?